3B FACTORY BATICE, Belgium Cladding system for offices and workshops of a fibreglass manufacturer Project 2011, Façade 1000m2, Budget- 4m 3B is an international manufacturer of fibreglass. 3B supplied the glass matting for the fibreglass panels used in the the cladding of the Sheraton Hotel, Malpensa. We were asked to design a cladding system for their research centre and offices in Batice, Belgium. The requirement was for a continuous facade that wrapped three different blocks: administration offices, workshops and an external exhibition area. 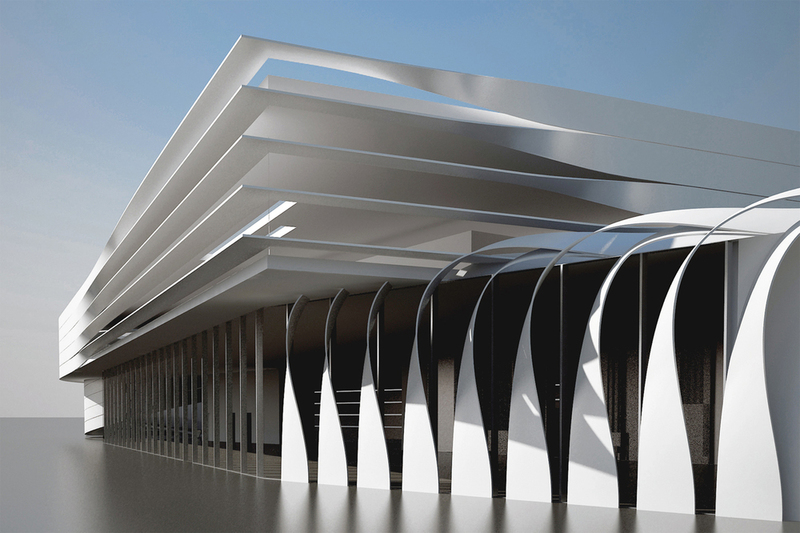 dynamic elevation studies It is made up of fibreglass strips of different widths. They spiral around the large circular staircase to create a main entrance. From here they wrap around the workshops, leaving wide slots for air ducts, to then detach themselves from the main block and form the exhibition area. façade studies of the office building The office block cladding continues with the same system, adapting this time to screen the curtain wall behind. The system of strips exploits the natural mono-directional elasticity of this material and very low thermal dilation coefficient. 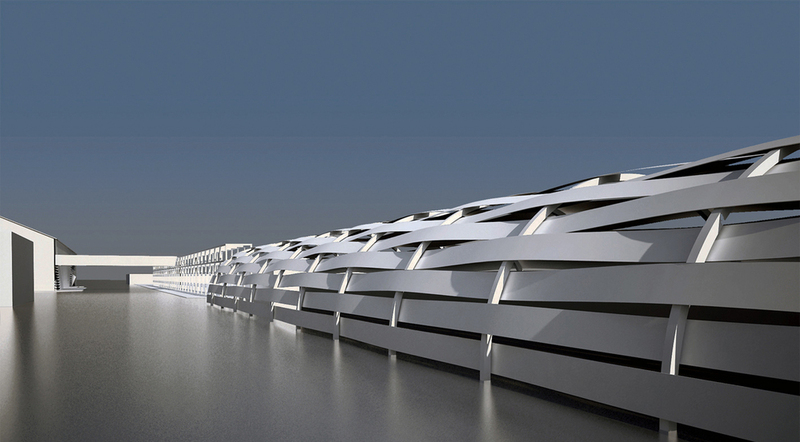 Cladding proposal for 3B factory outside Tunis. In addition to the exterior cladding the client also wanted as much of the structure to be realised in fibreglass. The gate house is completely built of fibreglass with strips that wrap around the front, back and roof. The car park is a shaded tunnel in which the fibreglass strips are woven into a kind of long basket. view of covered car park The scheme was limited to the most visible aspects of the factory from the main entrance road I.e: the main entrance gate house , the external car park and the administrative offices. The design of this building set out to obtain the maximum visibility from the passing motorway. The shape of the site like an arrow pointing in the direction of the motorway suggested the point as the main focus of the project. exterior rendering of volumes The building is shaped by a single ribbon of fibreglass starting from the road level containing the factory building which then folds back on itself and rises to house the office block. model- main stair block and offices The knot that is formed towards the motorway at the sharp end of the site becomes a dynamic sign seen by the traffic passing along this busy trunk road. site plan On the inside, the knot is where the level change between the two floors takes place, generating a dynamic double height space. The exterior cladding is shaped according to the window openings both horizontal and vertical which both encloses and describes the volumes of the building.